Lately I've been trying to refresh my blog's look. Yes, again. I've been looking at other blogs to figure out what I like and what I don't. I think choosing the right font really does a lot for your image. Am I cursive? Calligraphy? Block? Sans serif? You get the point. 2. 1001FreeFonts: I like that all the fonts on this website are for Mac and PC. There are also great search options, so you don't have to sort through thousands! I've also been playing with these fonts for a project at home, but more on that later. 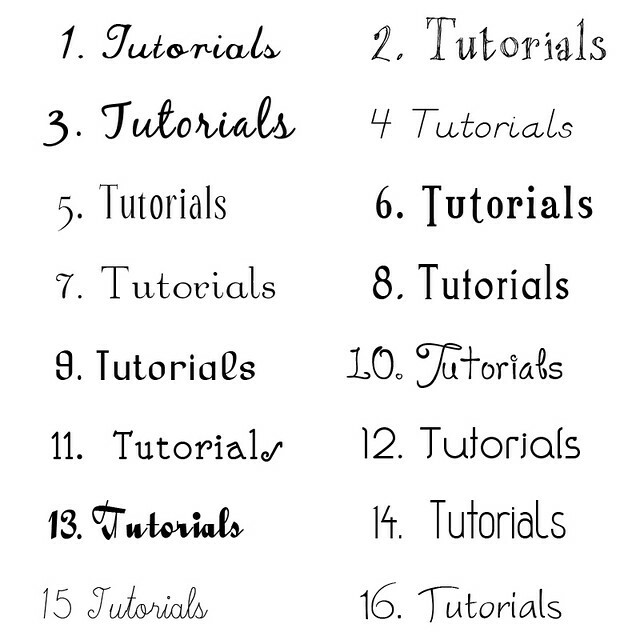 ;) Here are some of my favorite fonts for the blog. What do you think? Which one would suit this lil blog best? Do you want to help me along the way? I like #3 and #10. I'm also a Font Fanatic, and I absolutely agree with you -- a font can make a huge difference in how (and how well) people pick up a message. For whatever reason, I'm liking #6 today, but I suspect it's going to be the kind of thing that you'll have to pick yourself. 2 or 16. Love both of them! ok, so as a fellow font freak, could you post what the font names are so I do not have to go through 5000 fonts at each site??? merci! I love 16 and have no idea how to change the font on my blog. Help you along the way? Sure, how? I really like 16 also. My faves are 4, 12, and 14. Um, what kind of help?? I'm a font freak too. My favorite iPhone app: what the font. Because it sounds a teensy bit racy if you say it just right...but it's super cool at identifying fonts you see somewhere and wonder what they are! They're all really nice. But for your blog I think I like the less cursive script ones because it ties in with your banner more where you have quite a squared type of font. (Square font for a squared blog- hey, I see what you did there ;) Have fun choosing, I love them all, don't know how you're going to narrow it down! Are we talking the headers or the body here? I'm just asking because you may spend hours choosing the perfect font only to find that if the reader doesn't have that font installed then they'll see the default font, which is something like Arial IIRC. Also, as a dyslexic I have enough problems reading clear fonts, ones that are more 'challenging' (fancy curls and swirls) turn me right off sites instantly, I really don't want to have to work that hard to read something! I like #4 the best but #15 & 16 are nice too. it's plain, but funky....clear and easy to read!!! !